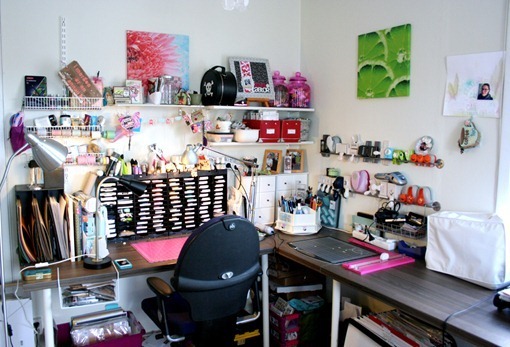 Little Outbursts of Creativity: Welcome to my craft room! 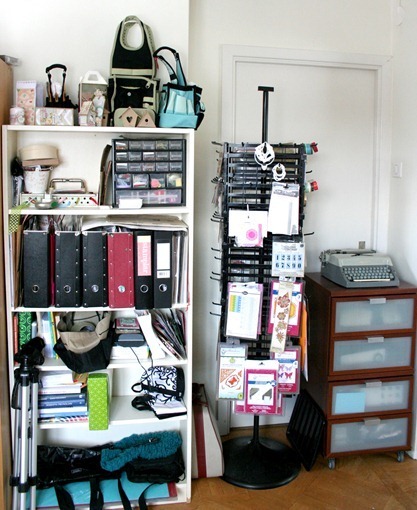 This week we have a storage theme in the Hobbyworld blog and I wanted to invite you to take a peek in my craft room. 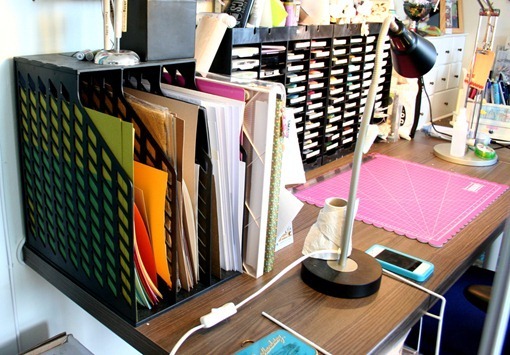 I love good storage, it makes it quick to clean up after a project and I can find all my stuff. Even though it looks like it, I haven’t trapped myself in the craft room. We have two doors leading in and I ran out of space so we stopped using one of the doors and I put some storage in the opening. I keep stuff I dont use that often in the drawers. I also have storage that I got from a store that was closing down to keep my dies and some embellishments on, I like just spinning it and seeing everything. I also hava a couple of bookshelfs with storage for alphabets and stickers. I also have some binders full of stamps here. There are a lot of random things living in these shelfs. 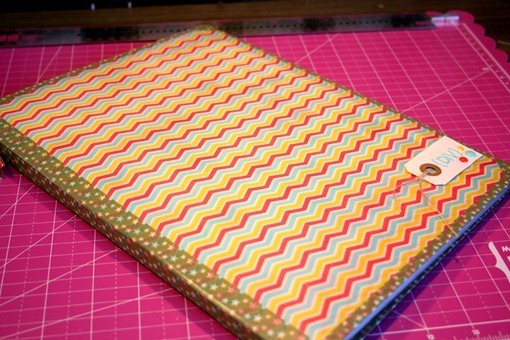 I have a great Cropper Hopper storage for my private patterned papers. I sort my papers by colors exept for the ones I have whole series of and some brands that I have a LOT from. They get to live by themselves. I try too keep down my paper collection to a size that will fit in my paper storage, if it overflows I take out older paper and those that I don’t think I’ll use and give them to the kids or to the school. I keep my DT-papers and embellishments in another place. 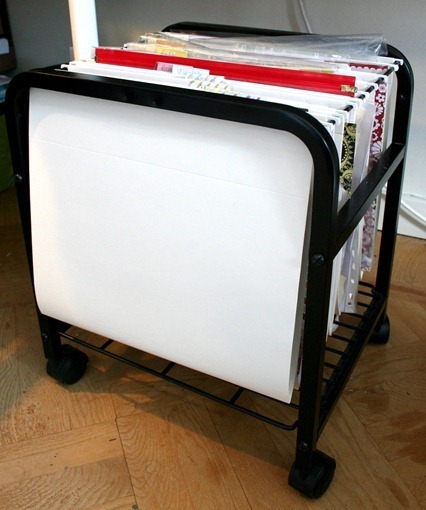 This is my storage for my own cardstock, this storage is also from Cropper Hopper. I sot white/grey/black by themselves, brown by them selves and then I have a few colored cardstock papers and they are sorted by color and kept frathest away. All my DT-cardstock lives with the patterned papers in another place. 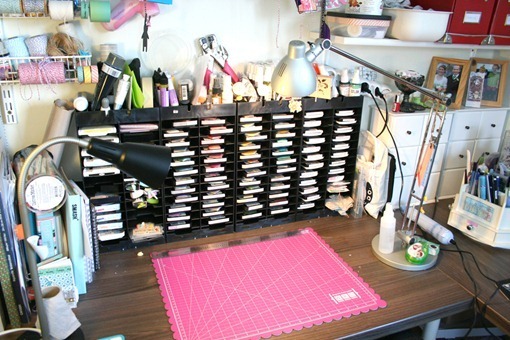 This is where I work on an amazing cutting mat from We R Memory Keepers. I never cut as much by hand as I do since I got this mat, it’s so easy when the ruler keeps the paper stuck against the mat. It also comes with some small magnets to keep the paper in place while working. Behind the mat I keep all my inkpads and some smaller things. I want everything I use often close by. I also wanted to show you my binder with color samples and other random stuff, I remade it just for you to see today ;) I have a lot of markers, color products, stickles and ink pads and I make my own color charts to see what I have. 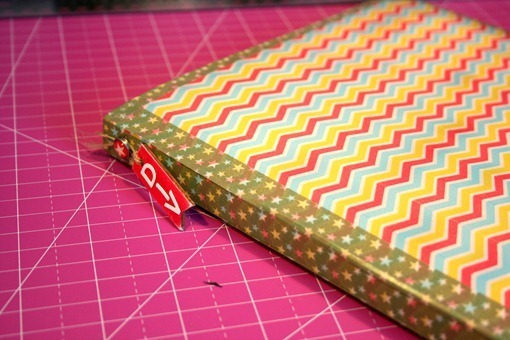 I keep them in this binder that had clear covers until I got a bit crazy with the washi tape from MME. I used up amost an entire roll but it was a quick and fun project. 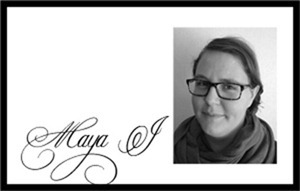 Since I use it frequently I did not put much embellishments on it. I just used some tags and enamel dots to keep it from getting stuck on things when I take it out. I painted one tag with nailpolish since I didn’t have the right shade in my crafting supplies. 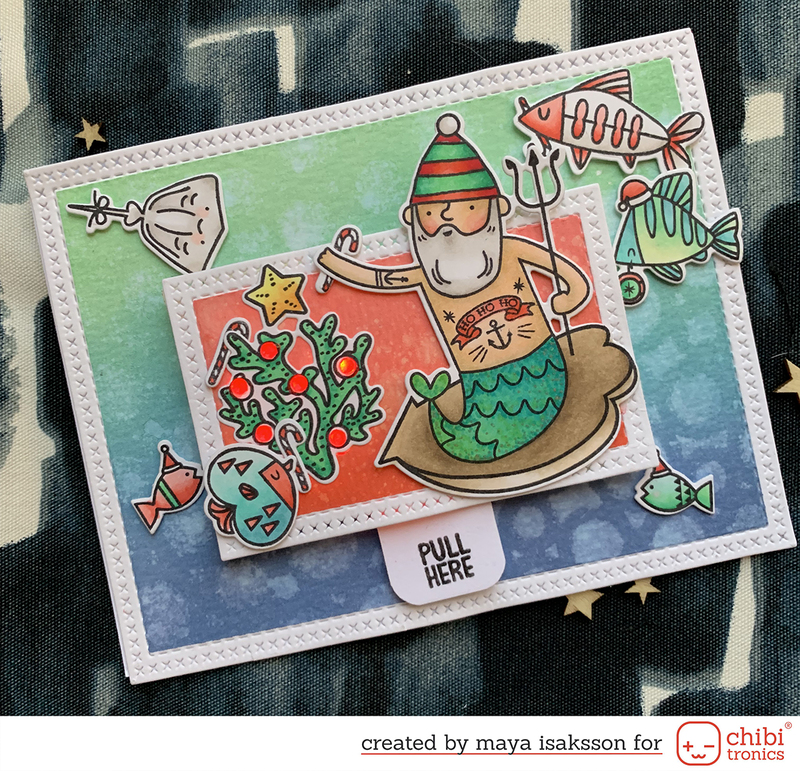 Thanks for stopping by to visit my craft room!